Léna Roy: EDGES Coming in Audio!!!! Happy Monday, folks! It sure is for me, as my fabulous agent, Edward Necarsulmer has given me the go ahead to share about our big coup in the audio world . . . He left me three messages on our last Friday in Myrtle Beach a couple of weeks ago, the final one asking me to call him on his cell as he was waiting to get on a plane for his own vacation. This was highly unusual: I knew that something must be up! He had just been to the Bologna Book Fair, so my heart was racing as I dialed his number: maybe he had news that Germany or England wanted to buy the book? No, too soon, but a gal can have big dreams, can't she? "Léna, I have some great news for you," he said, and then paused just long enough for me to start feeling dizzy from holding my breath. "Listening Library wants to pre-empt the audio rights for EDGES." "Pre-empt? Listening Library?" I asked, pacing the floor. I had no idea what that meant. "Listening Library is part of Random House. Pre-empt means that they don't want me to shop it around anymore. These two facts bode well for the future of EDGES, plus the fact that they don't do many YA titles." I was floored. "Léna? Are you still there?" Someone at Random House loves my book! Was all I could think. "So Léna," he said. "Now your book will also be available on I-Tunes, and will be published on December 7th in conjunction with the book!" "Thank YOU!" I somehow managed to stammer. Somebody else besides the amazing team at FSG loves my book . . . I just hope that you all will too! P.S. This photo up above is the sketch - the draft if you will, of the cover. I don't have the actual jpeg yet, and I believe that the cover may be darker . . .
Congrats! And it isn't too early for foreign markets. I already sold mine to some, remember? Go team! I'm dreaming big! Edward just pitched it in Bologna, so I still have to wait with fingers and toes crossed! BTW - lurve Lishism! Congrats on the Listening Library connection! They DO record YA books - sometimes in the voice of the author - That is why I chose them for your Gran's reading of 'WRINKLE'. Will they do the book in its entirety? Huzzah! 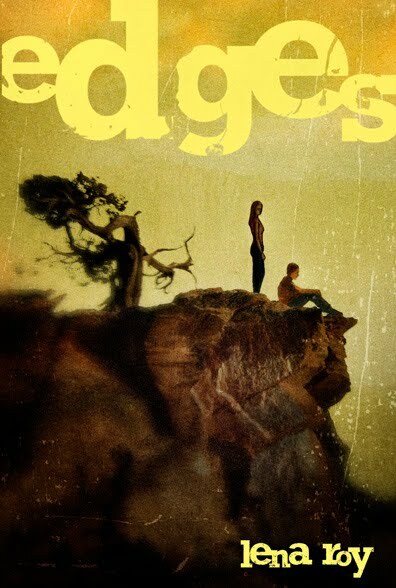 I look forward to seeing and hearing Edges in December. Hi Kristi! I feel so lucky getting to know you through this! And hi MaryJo - great to be connected again! Yay! I'm meeting with the audio editor on Monday, so I hope to find out more! Bright custom logo, paper for captivating newspaper replica chanel, is capable of doing delights around reinforcing a person's make. They usually are pretty flourishing publicize gear plus reasonable in addition in particular when you actually sequence around massive louis vuitton replica sale, which will cuts down the buying price of newspaper travelling bag printer a lot. Its a strong established incontrovertible fact that individuals by way of compel with addiction learn information and facts plus recognize illustrations or photos plus illustrations or photos paper on paper baggage. Enterprises might cash in on the following impulsive reaction with individuals plus give out newspaper baggage together with the custom logo rubber stamped in it. There are certain alternative explanation why newspaper chanel outlet printer might be a intelligent choice for your business enterprise. Straightforward portability has become the essential things about your newspaper travelling bag. Thus, a person's organizations sign and various information and facts, which have been paper to the baggage, switch coupled with these folks and get louis vuitton replica choice of remaining found by way of people today. Remaining extremely helpful plus louis vuitton replica sale, all these baggage will be placed by way of people today during its dwellings for long periods, plus provided a travelling bag is due to apply, your enterprise helps to keep finding insurance plan.